Arco Iris Spanish Immersion Charter School, the first charter in BSD, opened its doors to students for the first time in September of 2010 in portable buildings behind McKinley Elementary. No matter the weather, students had to walk outside to use the bathroom and parents waited outside for their kids to be released at the end of the day. The school didn't own much and had no reserve funds in the bank; but we were guided by the vision of our founders Danielle Siver, Mary Taylor, and Deonne Knill, careful financial planning of long-serving board member Jim Mullaney, and the passion of our teachers, staff, and families. Every year our school community grew and strengthened as we navigated the turbulent early years of starting a brand new school. Fundraising efforts began in our first year with many goals in mind, including the dream of one day moving in to a school facility that would allow us to grow to our full capacity and potential. 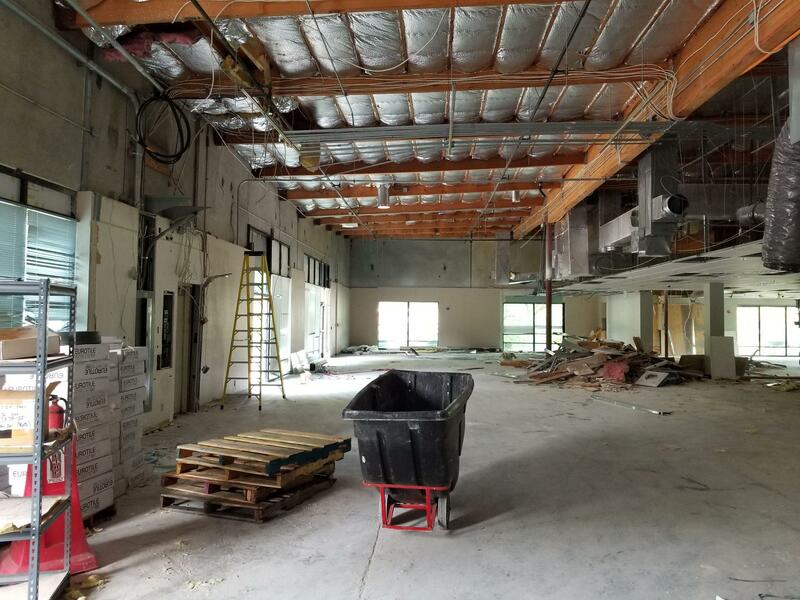 After years of searching throughout the city and vetting many potential buildings the school site search team toured the building at 8205 SW Creekside Place, the building that will soon be the permanent home of Arco Iris Spanish Immersion Charter School. 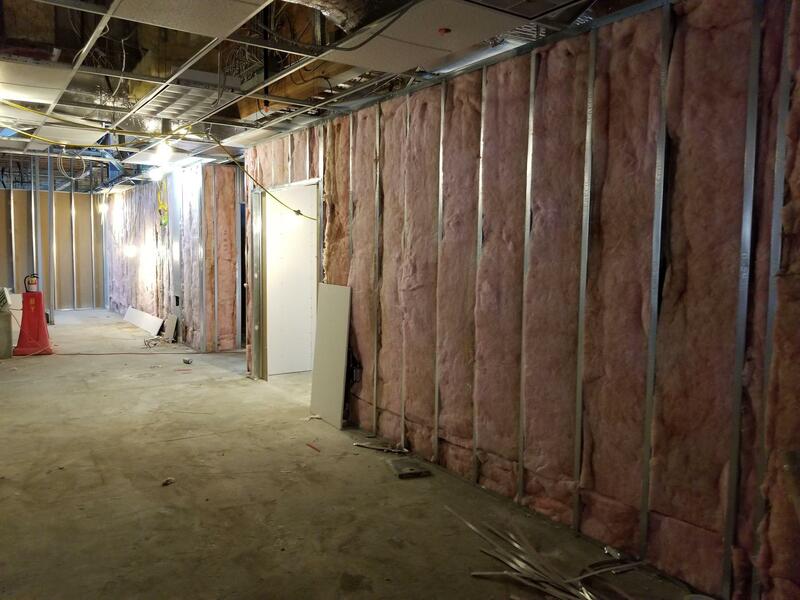 This journey is chronicled below, with photos and updates posted as construction continues. Have questions? Send them to becky.schiefelbein@arcoirisschool.org and they will be included in the FAQ section on the right. 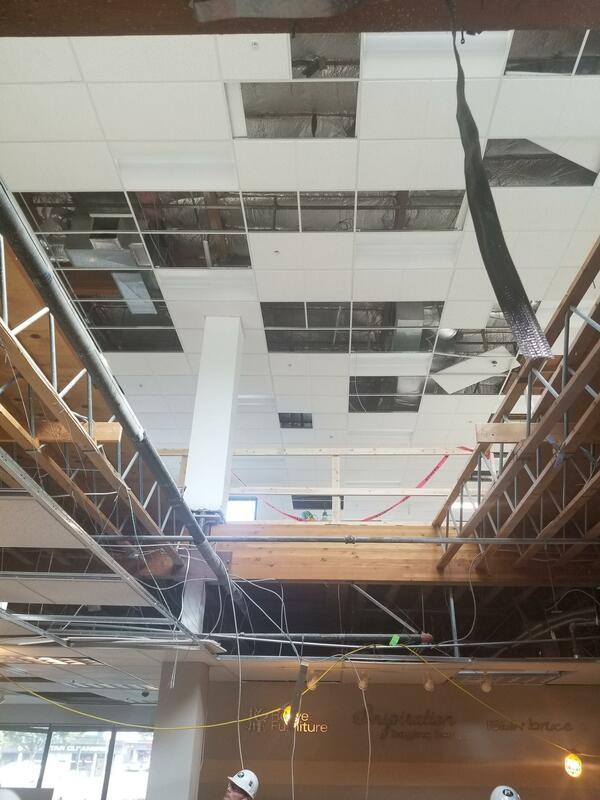 May 31st, 2017: The site search team tours the building at 8205 SW Creekside Place. After seeing that this building had potential to be used as a school the vetting process started. This included bringing in a structural engineer to advise on seismic retrofitting requirements and an architect to advise on school suitability. August 9th, 2017: The site search team meets with building officials from the City of Beaverton for a pre-application meeting to get feedback from each City department on potential issues with our proposal. At this point the school had preliminary plans drawn up by the architect and representation by a traffic engineer to help answer questions about our traffic impact. Because of traffic impact concerns the City asked ODOT to send a representative to this meeting. The meeting went well, but many concerns were raised that would have to be addressed in our land use application. 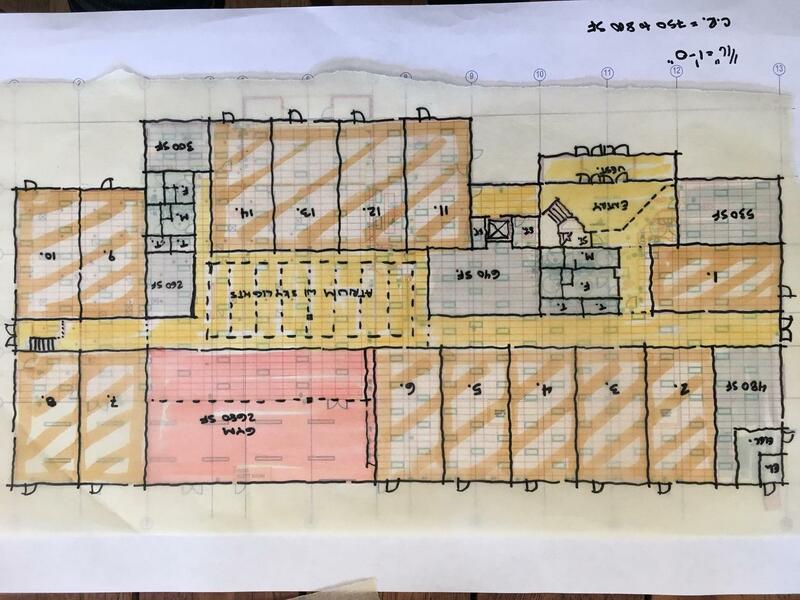 Initial sketch of the 1st floor, planned for the elementary grades. 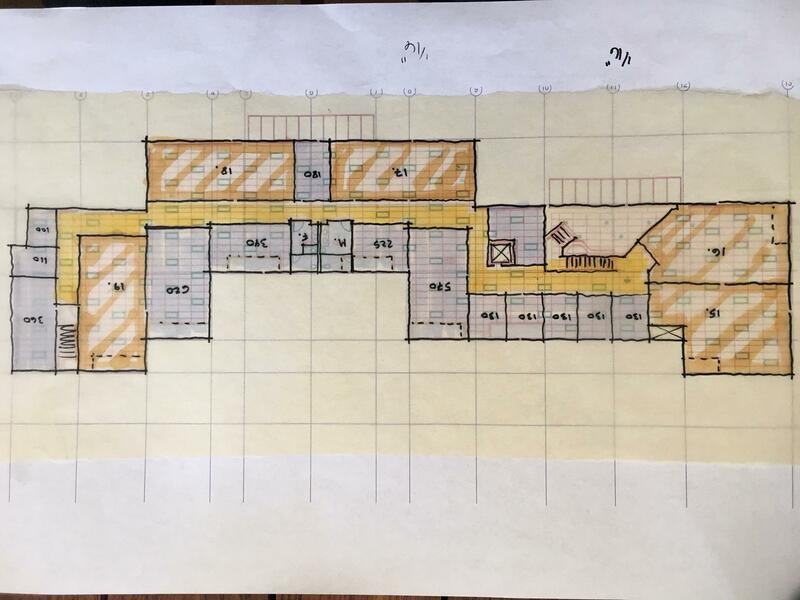 Initial sketch of the 2nd floor, planned for the middle school grades. 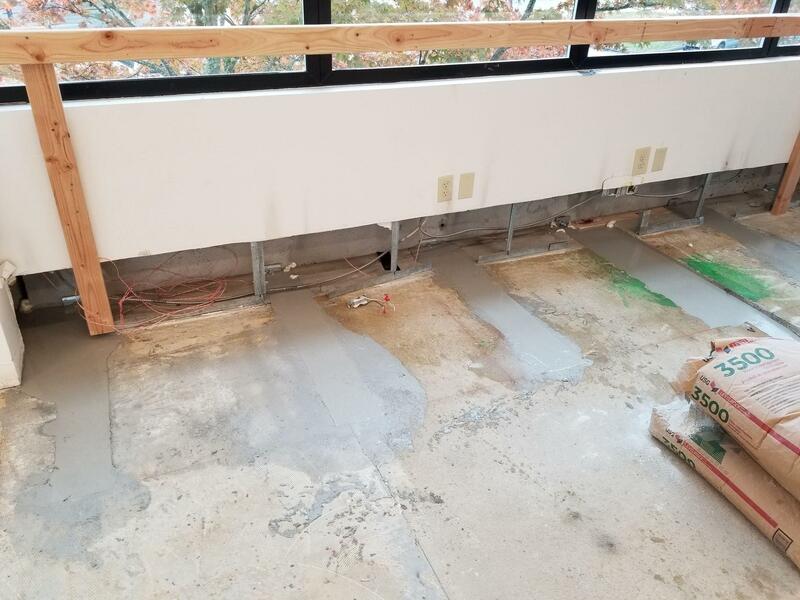 February 26th, 2018: In the course of working through the Land Use Application it was revealed that this building appeared to be in the 100-year flood plain which would trigger some expensive waterproofing requirements because of FEMA flood plain standards that weren't in place at the time this building was constructed. 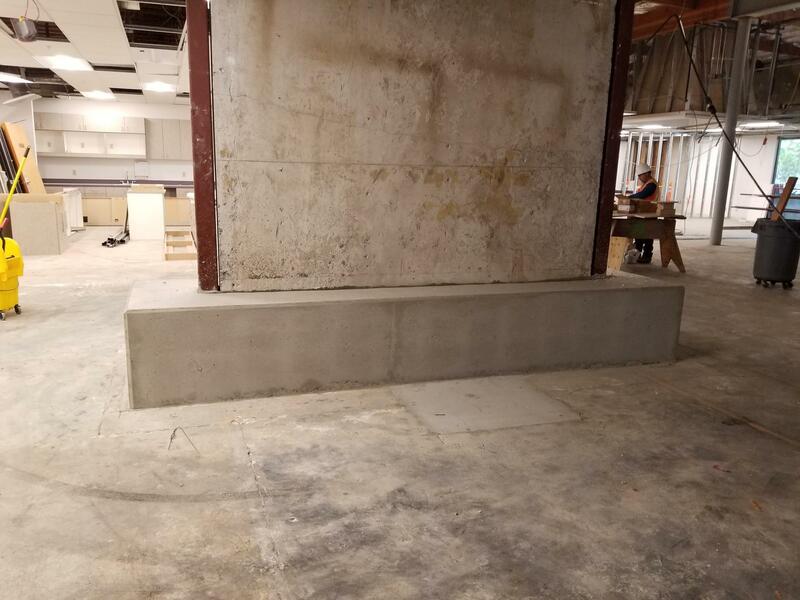 Those requirements included the construction of a flood wall around the entire perimeter of the building, which would not have been reasonable or affordable for the school. The team asked all vendors who were working on the project at that time to stop work while we researched this issue further. After extensive research and a meeting with the city we concluded that we needed to pull out of the purchase contract before the school's earnest money was lost. As a last-ditch effort a Flood Elevation Survey was ordered to confirm that this building was in the 100 year flood plain as indicated by the flood maps. 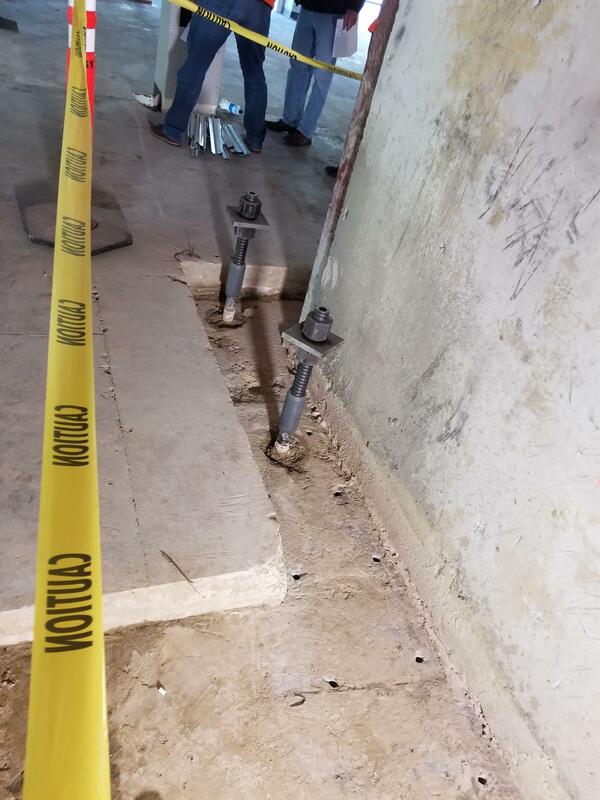 We were surprised and excited when the results of the survey showed the FEMA flood elevation numbers to be off by nearly 2.5 feet, and that this building was in fact not int he flood plain. With this great news in hand a new purchase and sale agreement was drafted. 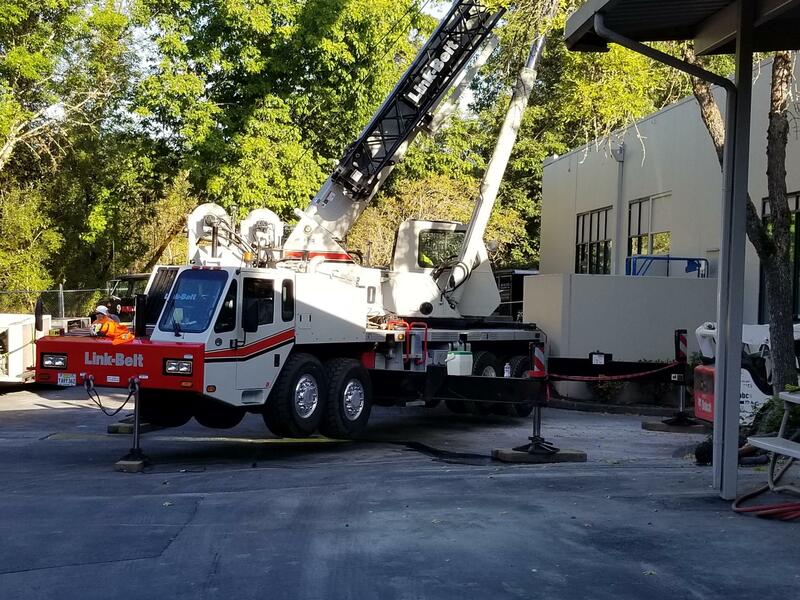 The next couple of months were focused on getting the project back on track and working through tasks related to funding, title, surveys, inspections, engineering, and land use. 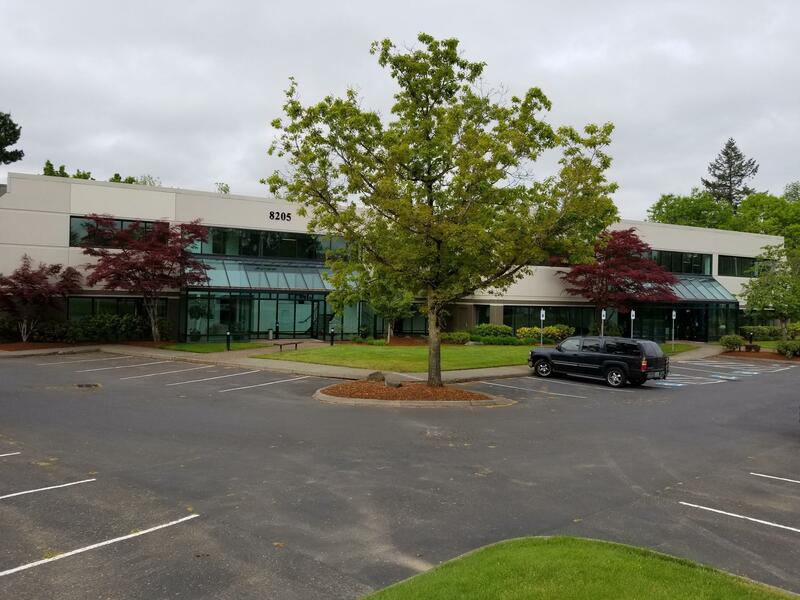 May 12th, 2018: The purchase and sale agreement is signed, putting us back in to contract on this building. Target dates and deadlines were then set for important milestones, and countless meetings began to happen, including weekly conference calls with an invitation list of 28 people. The summer was a blur of emails, phone calls, and meetings to get us closer to closing this deal. July 18th, 2018: Our land use application was heard by the Beaverton Planning Commission and unanimously approved. Our closing would have been cancelled if our application was denied, so a lot was riding on this hearing. July 31st, 2018: Closing Day! After so many months of work and preparation to get to this point, the closing happened in a conference call that lasted less than 5 minutes. 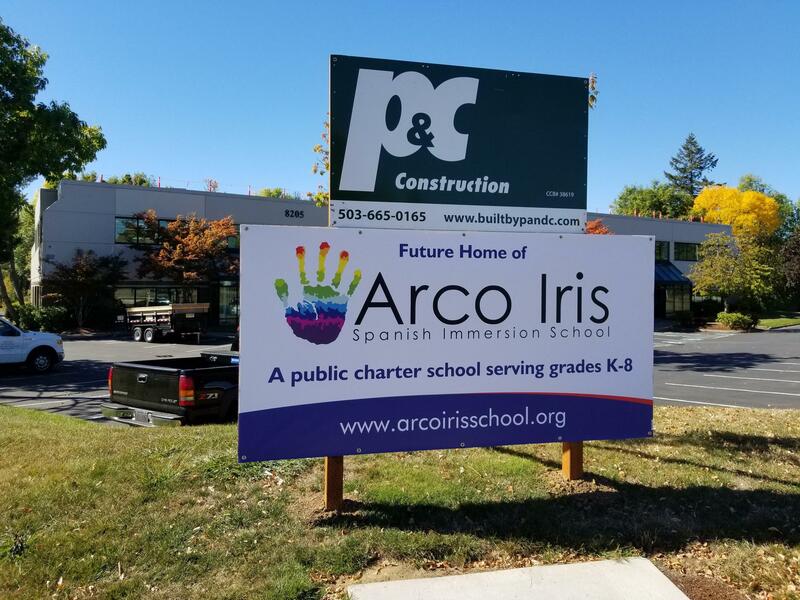 Eight years after opening our doors Arco Iris Spanish Immersion Charter School is the proud owner of a 33,000 square foot building! August 3rd, 2018: Construction starts, beginning with staging and demo work. 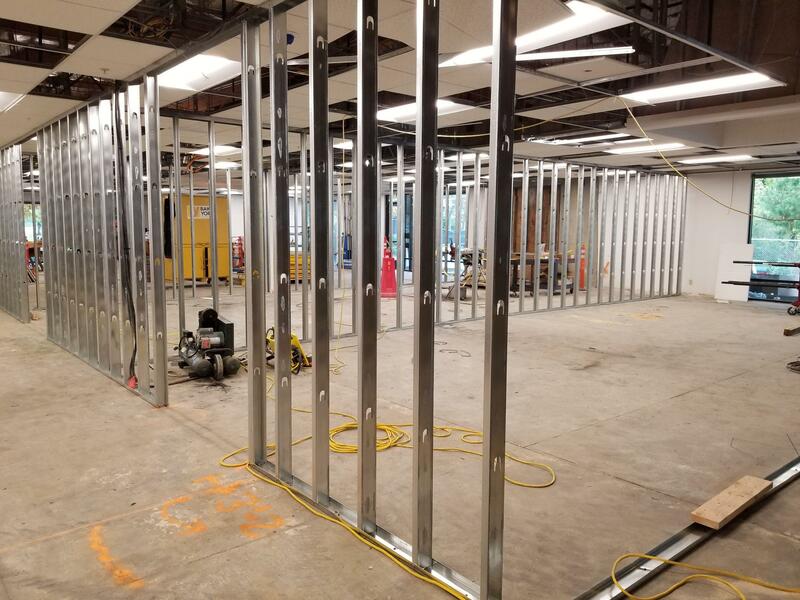 Progress updates and photos will be posted here so check back often to watch the office building at 8205 SW Creekside Place be transformed into our new school! Demo completed on our future gym space. 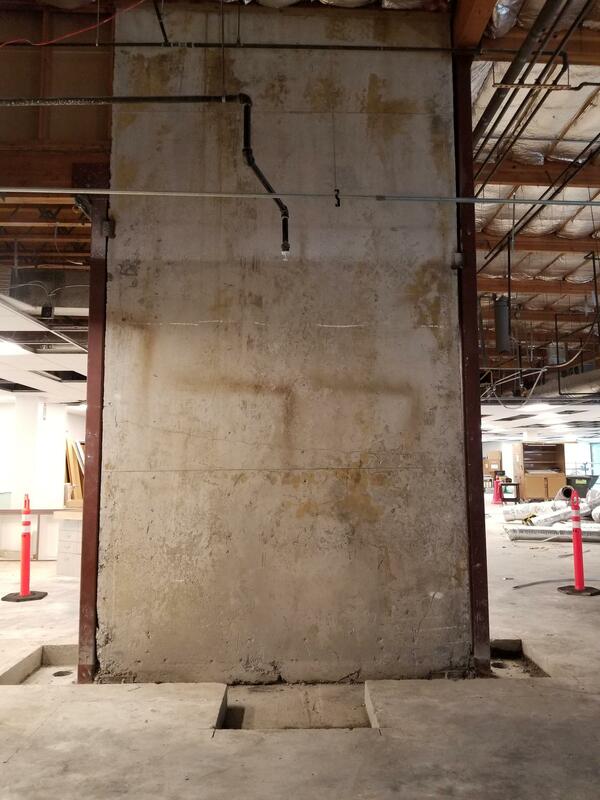 The first undertaking of this project, other than some demolition work, is the seismic retrofitting. This is also the most expensive piece of this project combining structural engineering, planning, and construction. Seismic retrofitting of this building, which brings the building up to current seismic requirements for a school, consists of three elements: 1) installing two areas of 'micropiles' that secure the building, especially the 2nd floor, to the ground, 2) strapping the floors to the exterior supports of the building, and 3) installing an 80 foot long steel beam above the future gym to secure this large open space. 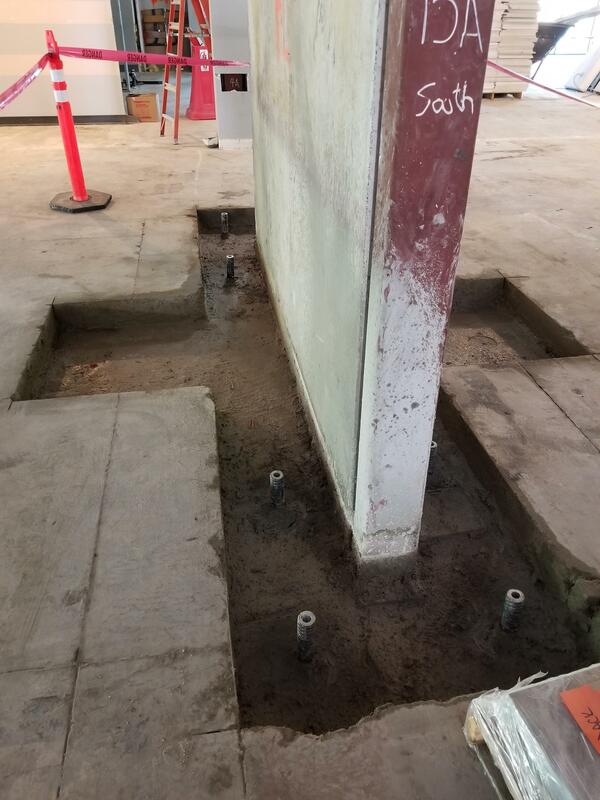 The following photos will chronicle the seismic retrofitting work which will take about 2 1/2 months to complete. Shear walls, that already exist in the 1st floor to support the 2nd floor. The concrete was poured over the rebar frame on 10/24. 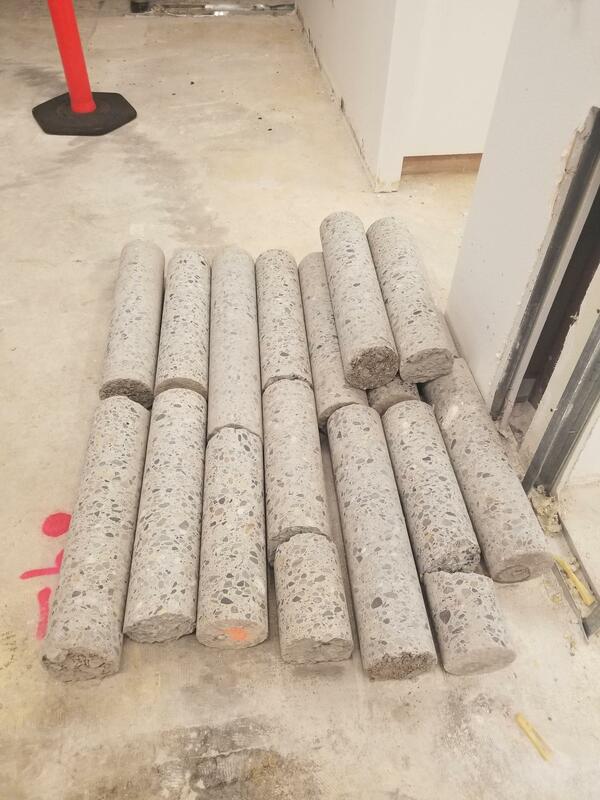 For now these will be benches. But eventually will have display cases mounted on the concrete slabs to show off all of our awards and accolades! 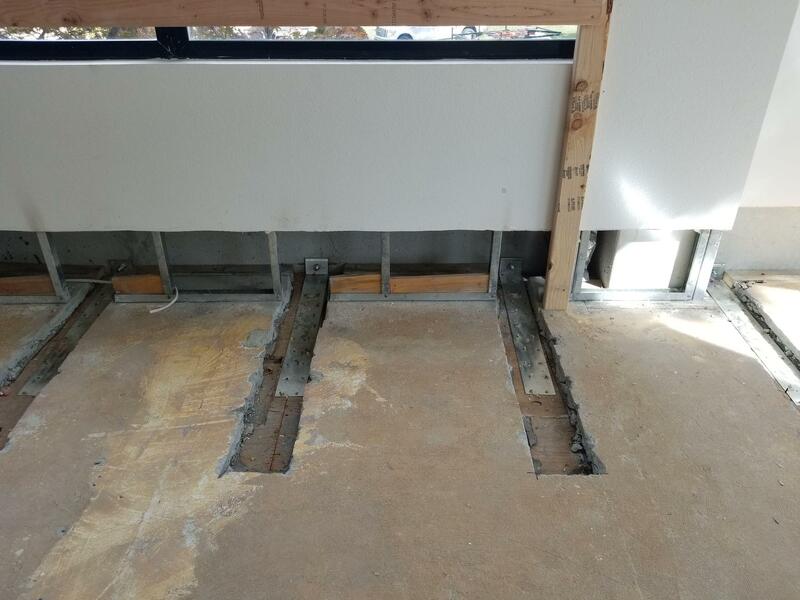 Cutting in to the floor to install strapping. 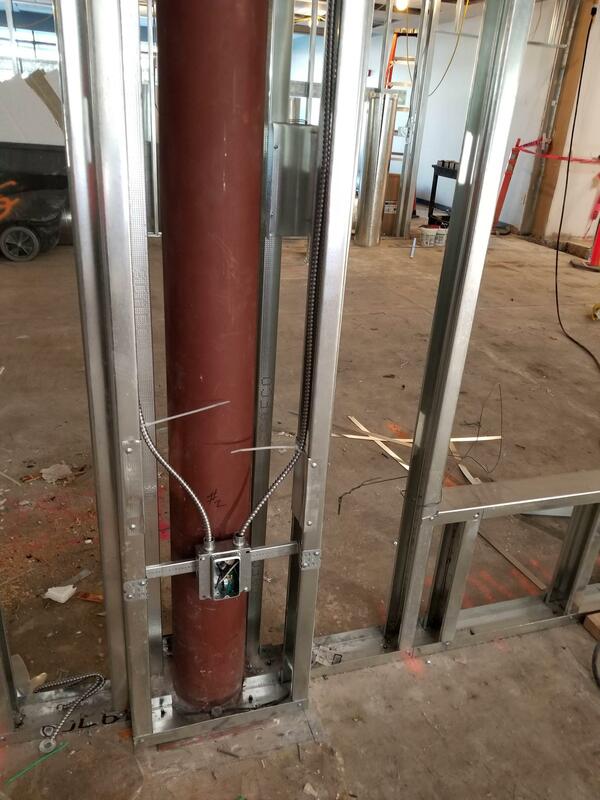 Metal strapping bands that secure the floors to the exterior walls. 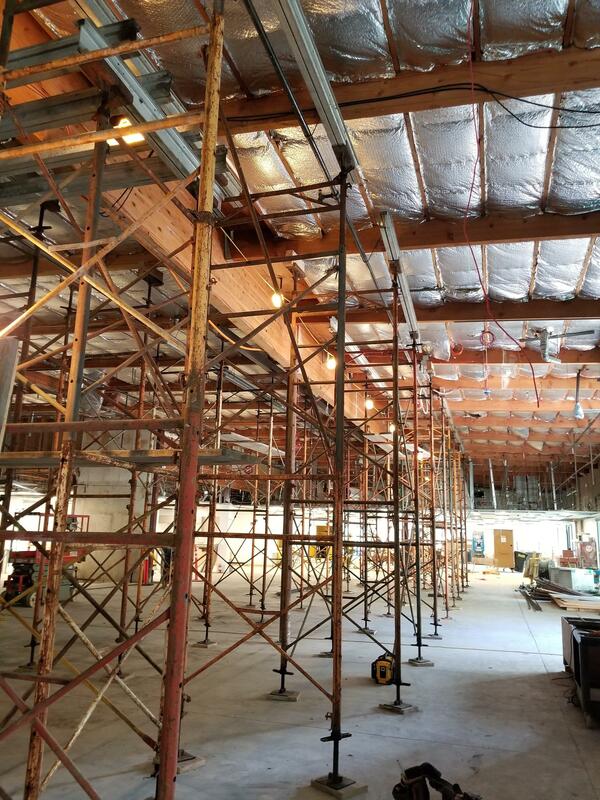 Scaffolding supporting the roof while the beams are swapped out. 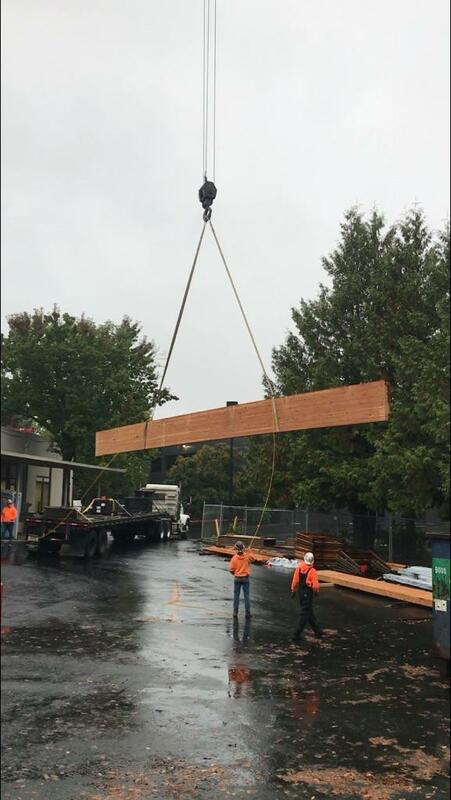 The wood beam being lifted out of the building. 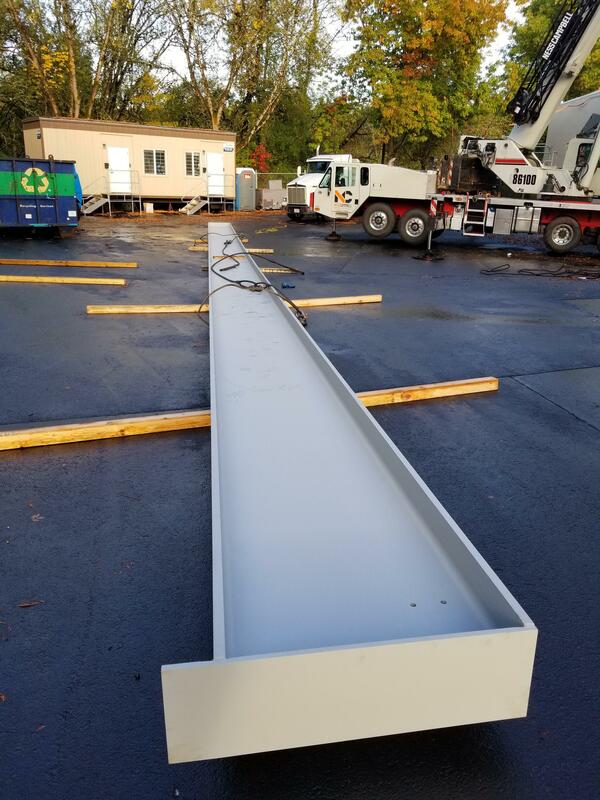 The new steel beam waiting to be lifted into place. 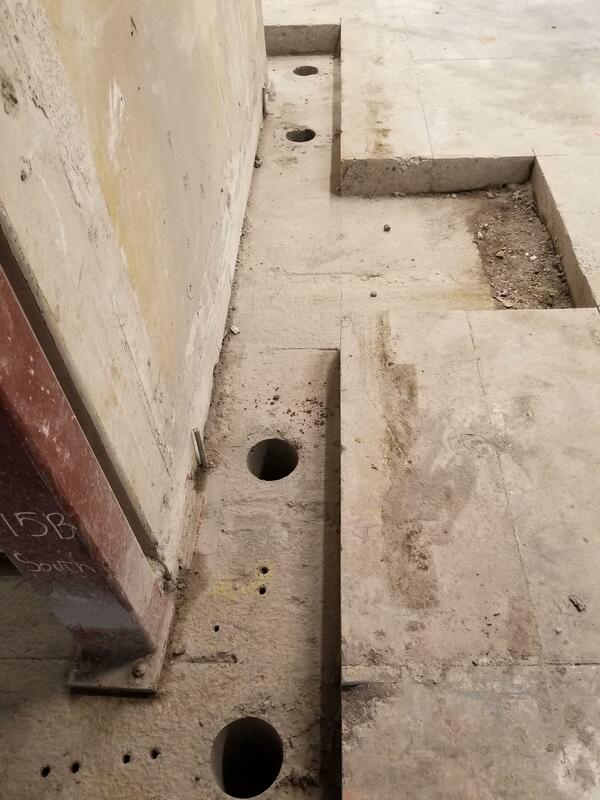 Footing of one of the steel columns. The new steel beam in place. With the beam tied into place the scaffolding could then be removed. 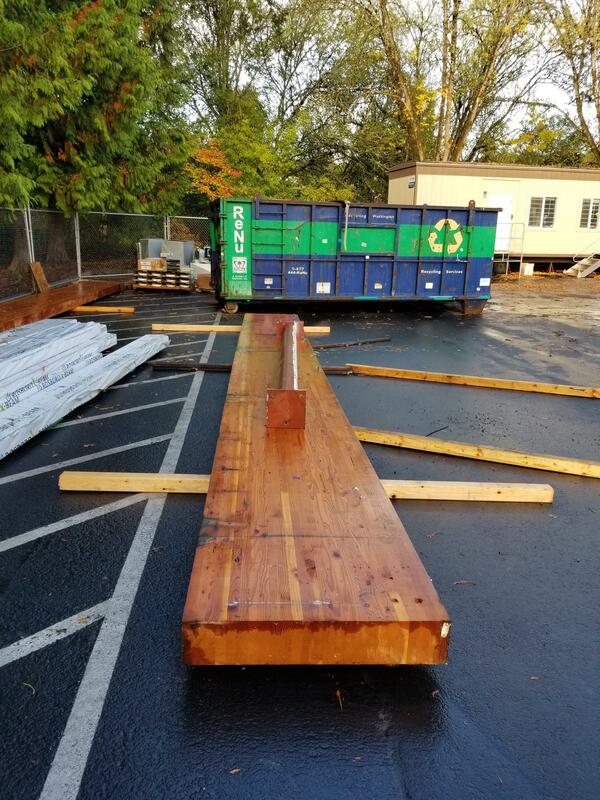 The span of this beam, plus 5 feet, shows the size of our gym. 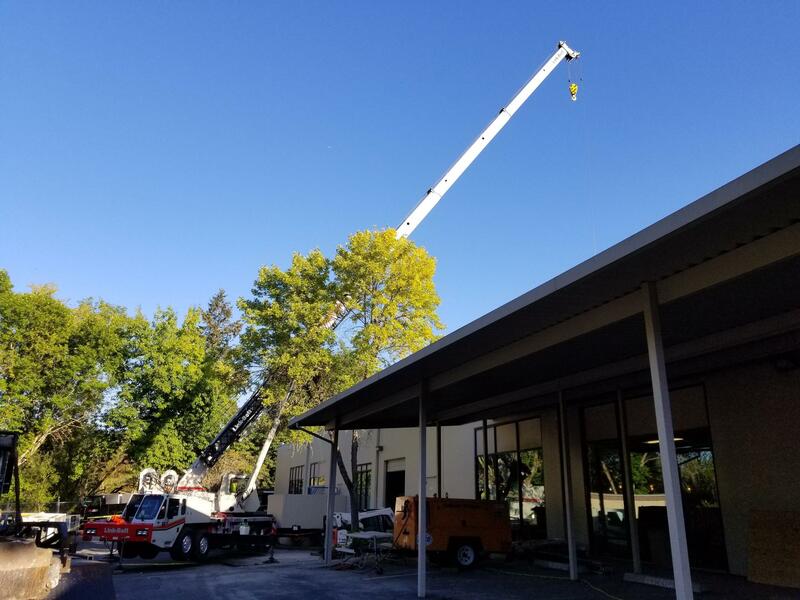 The steel columns were set in place and the new beam was lowered into place. 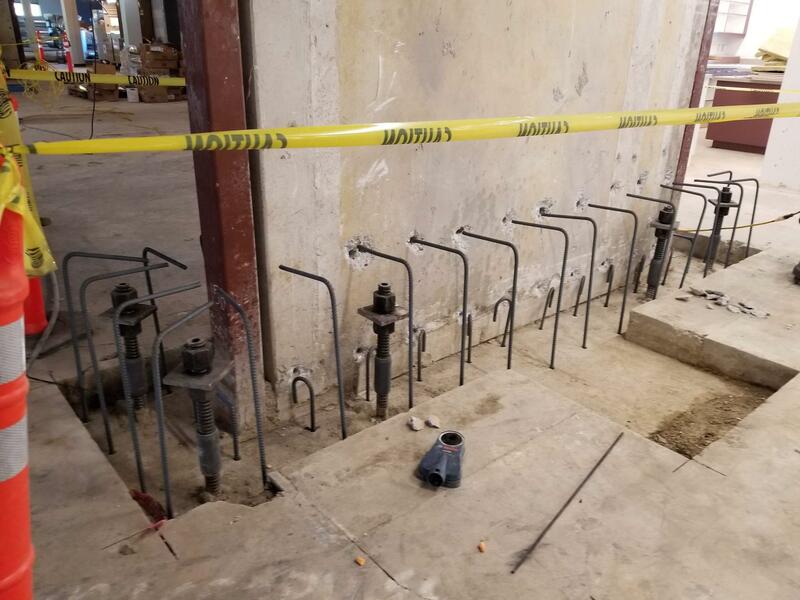 The scaffolding will come down when all the connections have been made and tested. 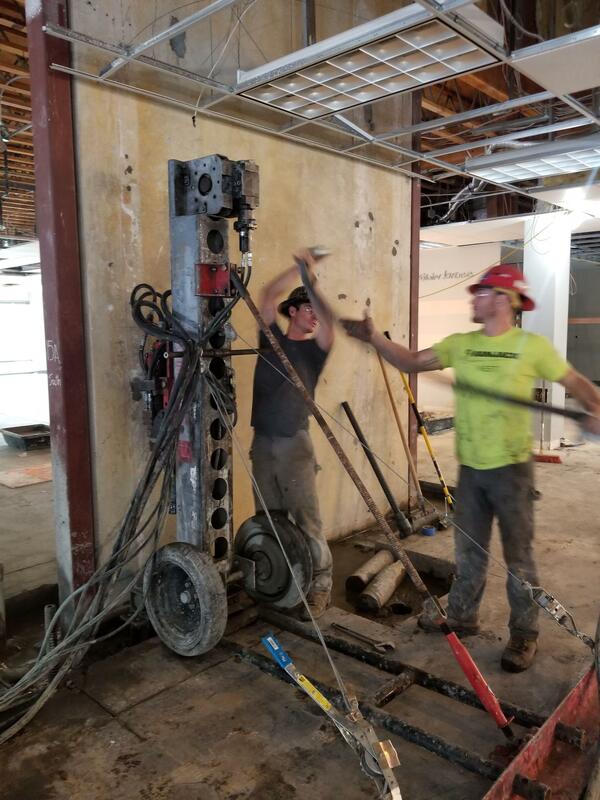 The steel beam will remain exposed so you'll all be able to check it out in person when we move in. 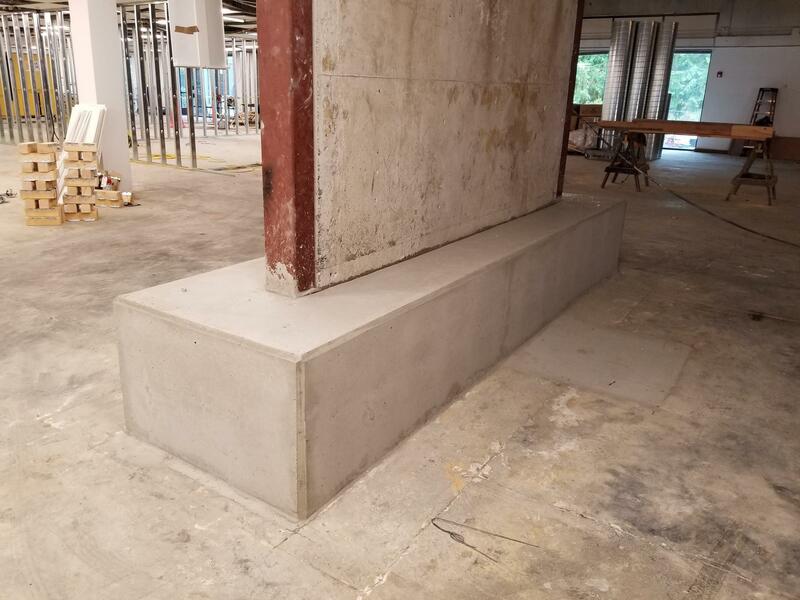 A second set of stairs is being installed in the west side of the building. 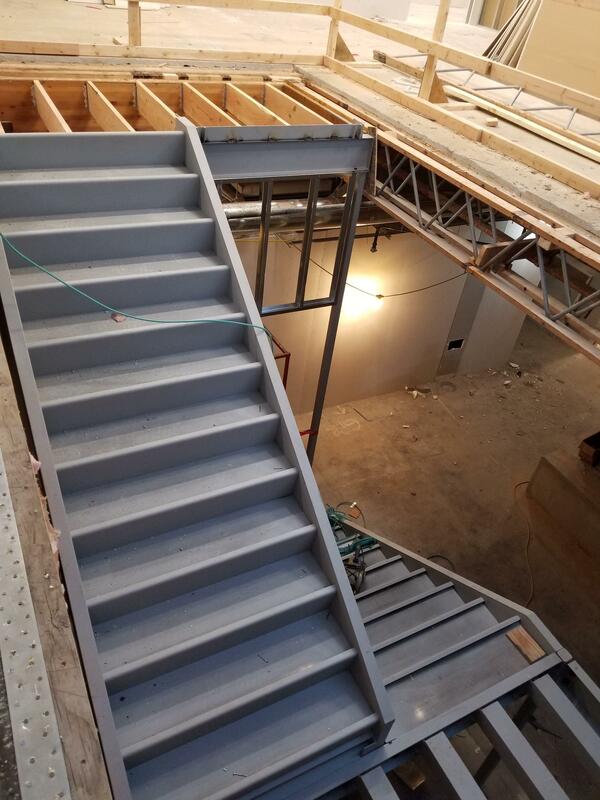 The opening has been cut in the 2nd floor for this and steel framing of the stairs is being completed off-site. With the new steel beam in place in late October, just before our first very wet day of the fall, the new roof is installed. Curbs are still being completed on the roof to accept our new HVAC units. Upstairs, a view of our new stairs and part of the library. Really cool dumpster truck to take the waste of the old roof away. Framing will move quickly, which is exciting because of how it shows us our spaces in a tangible way that floor plans just can't. 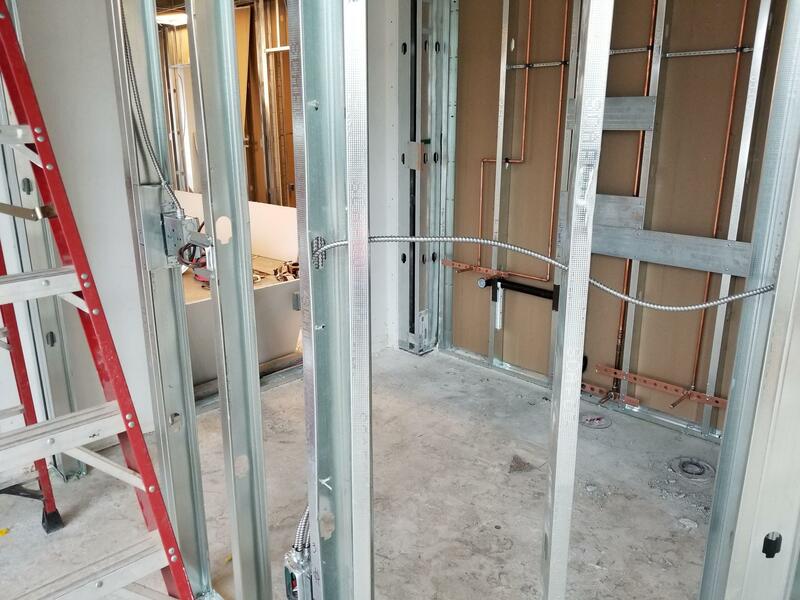 Electrical and drywall follow quickly. Insulation helps with noise control. ...and A/B switching allowing the teachers to turn off the lights near the whiteboards but leave other lights on for working. The new stairs are installed. They will be painted purple, as will all structural steel that is exposed in the building. 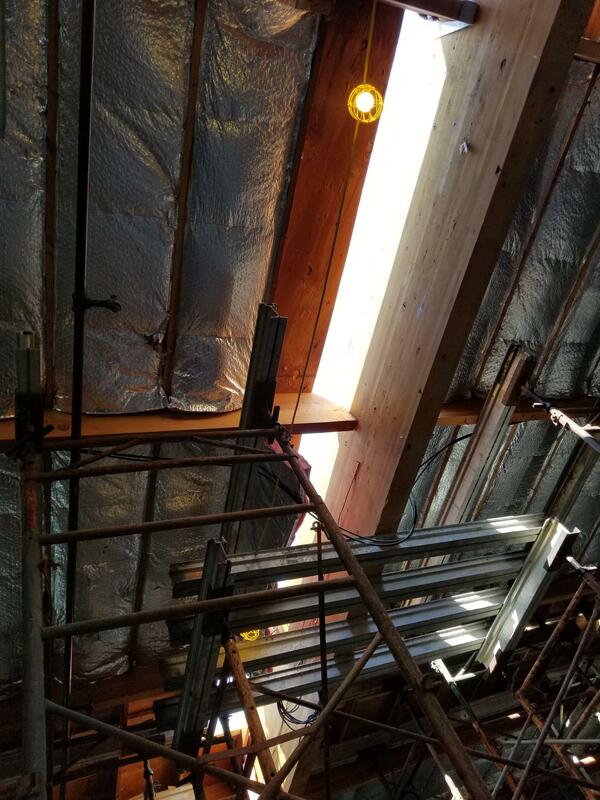 The industrial look of the exposed opened framing of the new stairs was very attractive, until we discovered that fire sprinklers had to be installed underneath the treads to meet fire code. It was decided that the sprinklers would be way too tempting for kids to hang off of and they needed to be protected. 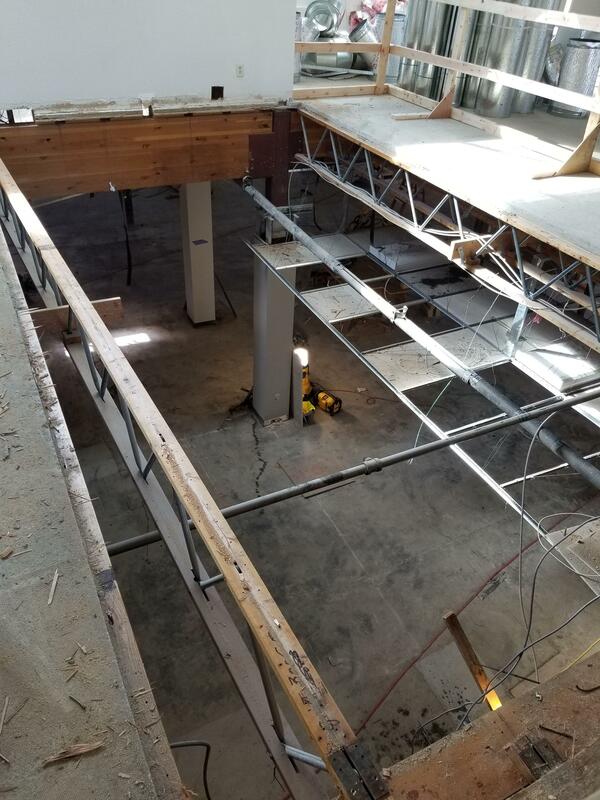 Walls will go in behind the steel framing so the structure will still be exposed, even though the stairs will no longer be open. There is an existing loading bay at the back of the building with a metal roll-up garage door and drop off to the ground below. The door is being replaced with glass to allow even more natural light into the gym. 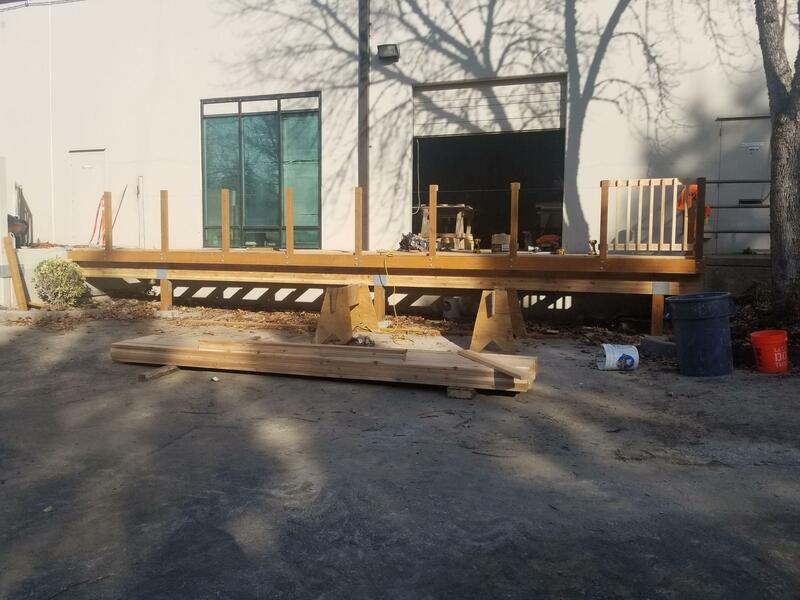 A deck is being built to allow easy and safe transition from the gym to the back parking lot where our playground will be installed and the kids will have recess. 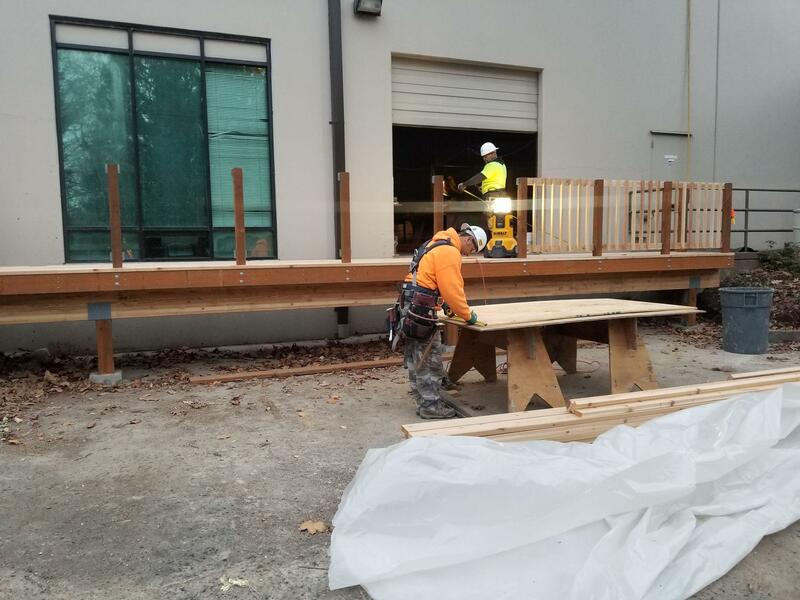 Deck construction starts to bridge the dropoff outside the loading door. The deck is done and framing starts for the new glass doors that are replacing the metal door. The gym is looking fantastic! 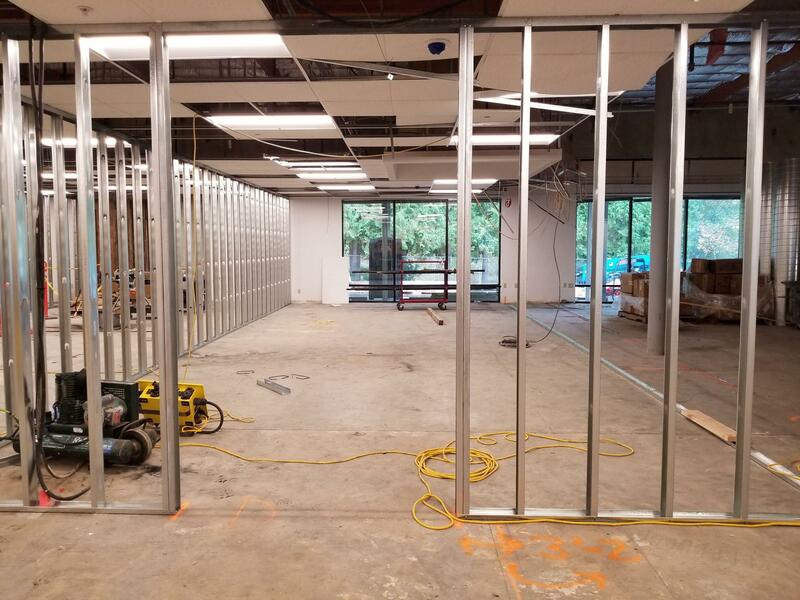 The wood at the ceiling is now entirely exposed, the steel beam has been painted, ducting and lighting are installed, and the walls are painted. 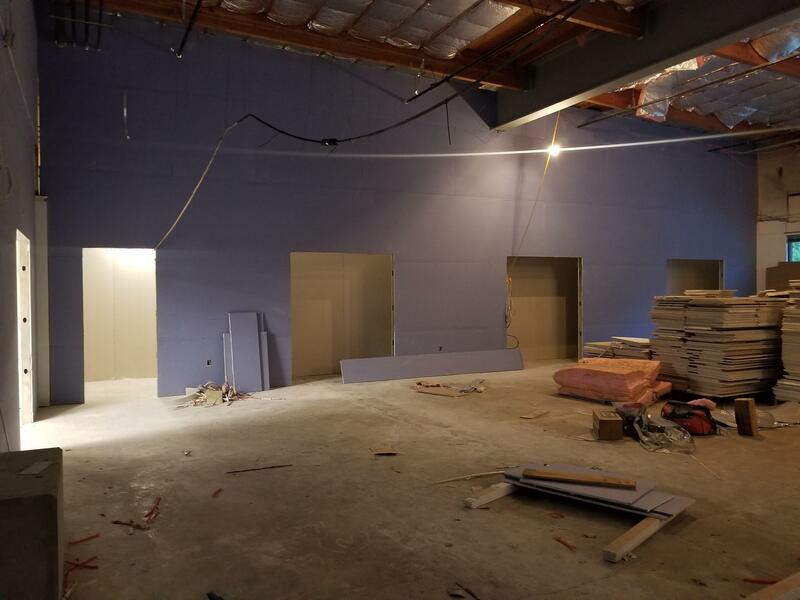 The wall paint is a special product that is meant for projecting video so we will be able to watch movies or project presentations on any open space in there. 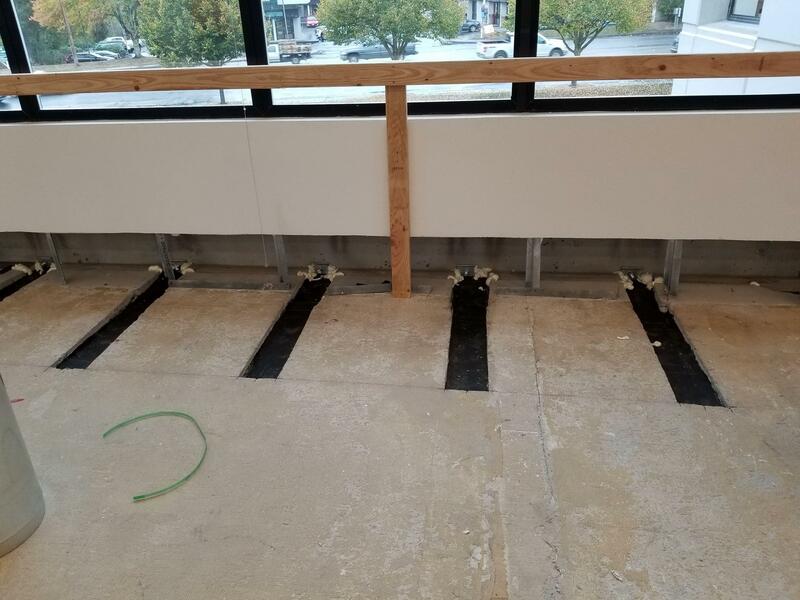 The flooring will be installed in a few weeks. 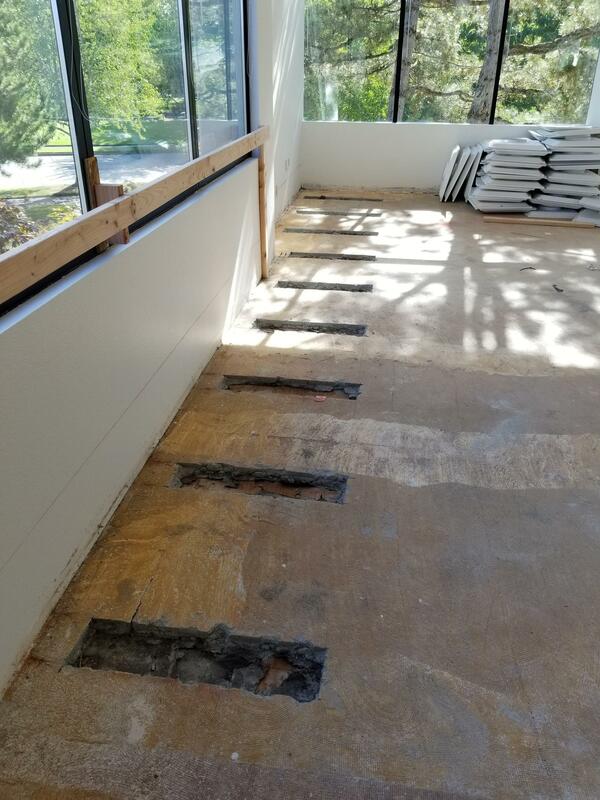 Unfortunately wood flooring is way beyond our budget, so a poured rubber flooring was selected that has the same bounce rating at wood floors and is already being used in other local schools. The floor will include striping for basketball and volleyball and will have recessed sleeves for volleyball poles. This end of the gym has space for bleachers. The other end of the gym has a wall of storage. 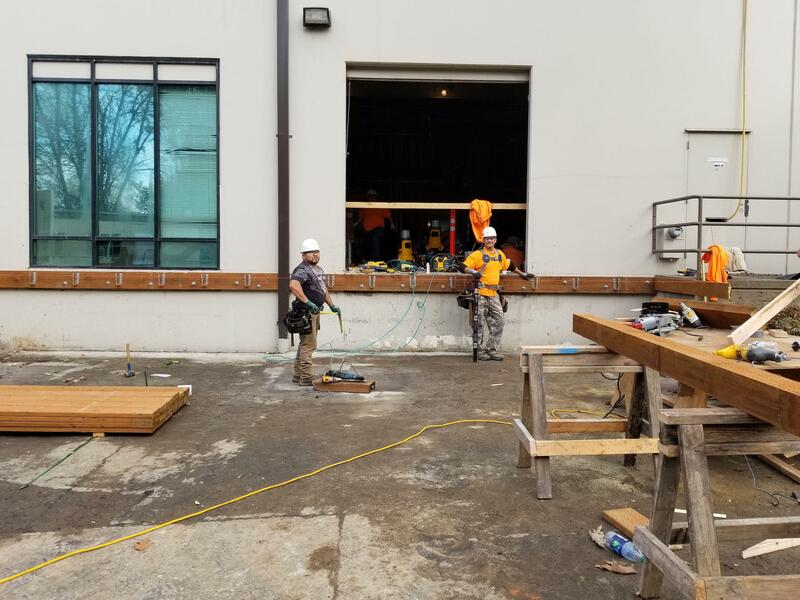 The glass doors are being installed where the metal loading bay door was before. The staff lounge has a small kitchen with space for a refrigerator and wall of windows. They may only be urinals, but they are brand new and were just installed in our brand new bathroom! Technology in our new building is very exciting! More info and photos will be posted in February, but here's a teaser - these are the data wires for only half of the building! This building has an interesting but odd floor plan, which meant that we had some very odd-shaped spaces left after fitting in our 19 classrooms. Check out the floor plans tab to see how we used these odd spaces - PTO workroom, Library, and kitchen/cafeteria. 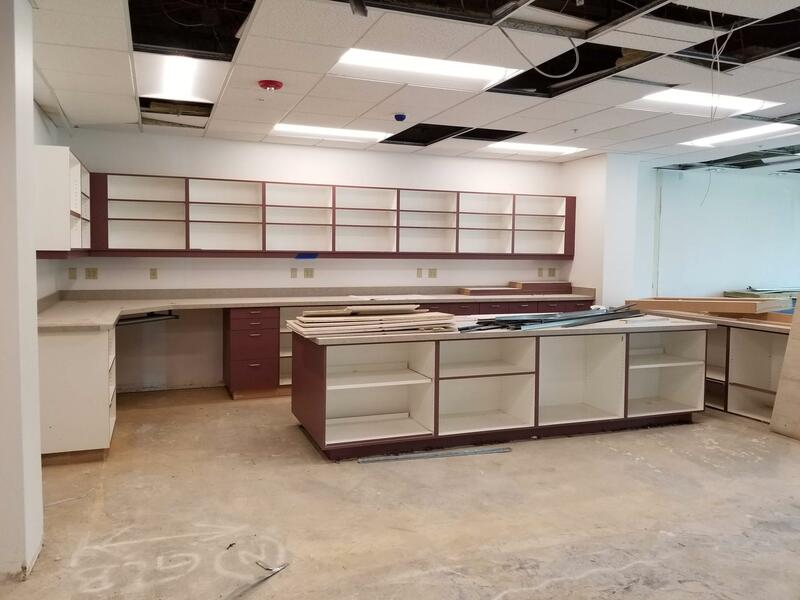 Here's a video of the PTO workroom, where we reused existing cabinets in the building and a VERY large island workstation with tons of storage. 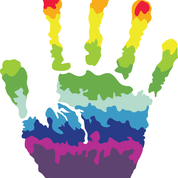 If your family joined Arco Iris after our move to the BCC campus you may be surprised to hear that our current administration area is the nicest and largest (by far!) space our amazing admin team has ever occupied. The new admin space is large and modern with two private offices, a staff mail and copier room with private entry, nurse's station with room for two beds, staff bathroom, tons of storage, spacious visitor's area, room for 3 people to work comfortably, lots of natural light, and visibility to the main entry. 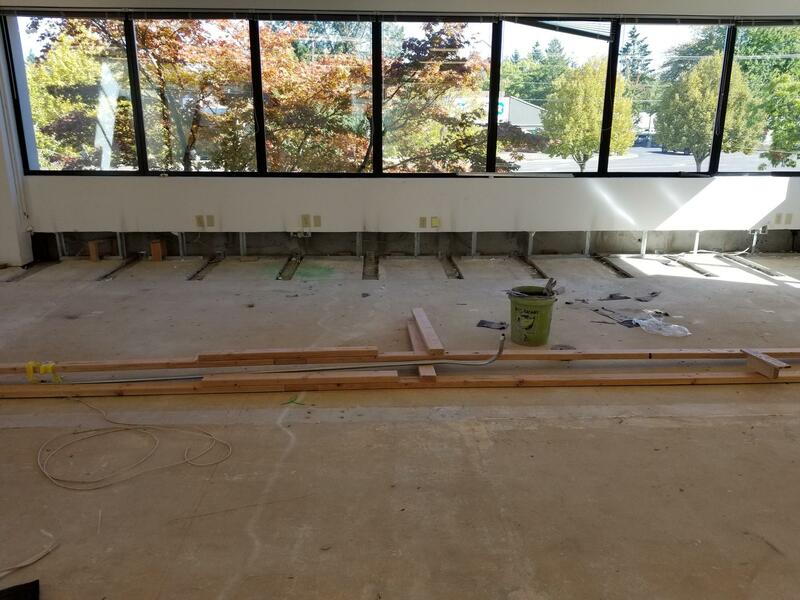 The casework was installed this week and the space is taking shape. This is one of the most important spaces in the new school where visitors will get their first impression of our school and where our admin team will manage the daily school operations. Finishes are starting now, including wall painting and flooring installation. Finishes are in the photo below. The colorful rainbow tiles will be throughout the school as accents in the primarily gray floor. The colored floor pattern can be viewed in the Building Plans tab. Keep in mind the light gray field tiles in those plans is actually the dark gray you see below. The black carpet with stripes of rainbow at the bottom of the photo will be installed in the entry, admin area, and offices. Our new bike racks at the front of the building. Work in the gym hasn't stopped. The flooring is a poured rubber product over two sub layers that went in after the subfloor was smoothed out. 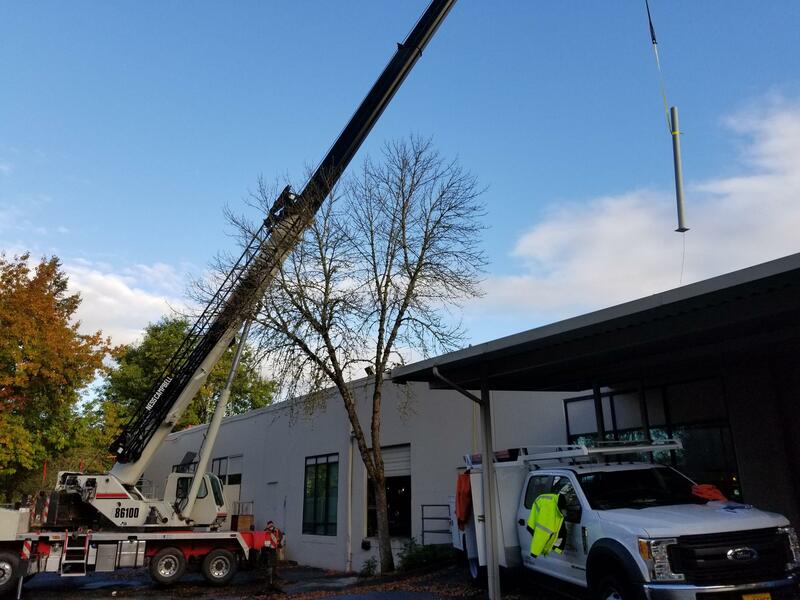 While doing an exterior building examination on March 7th we got to see Mother Nature at work at our new building and it was very exciting! It started with some geese squawking loudly and we looked just in time to see that they were reacting to an osprey diving down toward them, then moving on flying across our back parking lot, and perching in a tree next to where our future play structure will be located. We went to check the area out more and noticed that 3 young trees about 10 feet back from the parking lot curb had appeared to be cut down. Closer examination revealed that we have some very busy resident beavers! One of the 3 small young trees that was cut down. Clearly the work of beavers! The result of their work, just behind our school.